Buganda Land Board MD warns Masaka district leaders. Buganda Land Board MD Omuk.Kyewalabye-Male on Wednesday, 30th January toured part of the 2013 Buganda Kingdom returned estate in Masaka to assess the situation on the ground, after a boundary opening which took place at the request of district leaders who wanted to know the boundaries of the kingdom returned estate in Masaka. Masaka district leaders have previously been issuing land titles on the returned estate claiming that they didn’t know the boundaries of the land which belongs to Buganda kingdom. This prompted a boundary opening activity which was carried out by the Buganda Land Board survey department. With the boundary opening done, the MD warned district leaders against issuing more titles on the land since the boundaries are now clear. He warned that Buganda Land Board shall take legal measures to cancel any title illegally issued by District Land Board on the land. 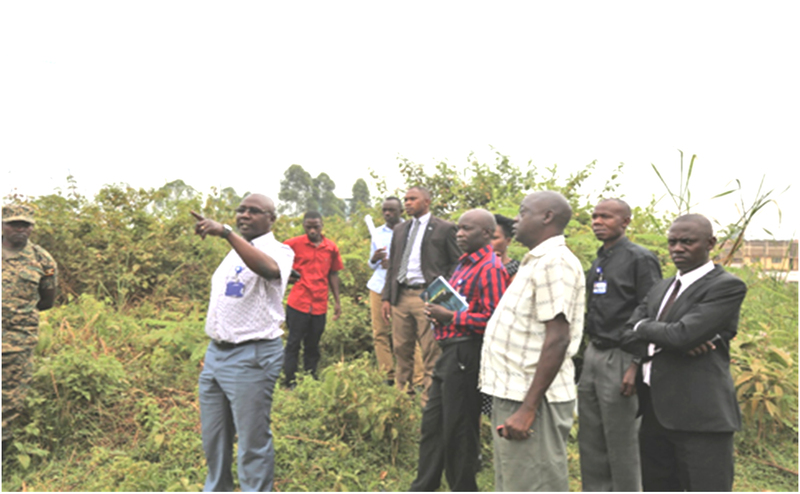 Before touring the land, he first held a meeting with the BLB branch manager of Masaka Mr. Charles Kabonge whom he instructed to ensure that district leaders are taken on a tour of the boundary opened land for them to get conversant with it. Also, to see to it that the Kingdom land is protected against encroachment and that those occupying it illegally are prompted to regularize their tenancy. Omuk.Kyewalabye-Male toured the land with the official in charge of land on Buddu county council, Mr. Kizito Kawonawo who appreciated Buganda Land Board for conducting the boundary opening which has made the boundaries clear and said that had given them ground as a Kingdom county to carry out their operations to help protect Kingdom land.